NVRHA places emphasis on the fun associated with not only achieving, but celebrating success. Two award systems are used, (1) - Placement Points - is based on skill levels (Novice Amateur, Limited Amateur, Amateur and Open) in the form of year-end awards, and (2) - Champion Points - is based on “Level of Achievement” where all horse/rider teams at an event are compared against a “standard of excellence”. AMATEUR Placement Points are earned at each event and used to determine the Year-End High Point Division Awards. The horse/rider team must participate in all five classes (Ranch Cutting, Working Ranch Horse, Ranch Trail, Ranch Riding and Ranch Conformation) in their Division (Novice Amateur, Limited Amateur, and Amateur) to be eligible for Placement Points. Year-End awards are based on the highest number of Placement Points in a maximum of five schooling competitions. Placement Points zero at the beginning of every Event Year. Affiliates often use these points for their year-end high point awards. See Rules & Regulations for current and complete details. OPEN Placement Points are earned at each event and used to determine the Open Year-End High Point Award. This award is for the horse having the most Open Placement Points in five events. A horse must participate in one cattle class (Ranch Cutting, Working Ranch Horse), one dry work class (Ranch Trail, Ranch Riding), and Ranch Conformation to be eligible for the Year-End Award. Placement Points zero at the beginning of every Event Year. Affiliates often use these points for their year-end high point awards. See Rules & Regulations for current and complete details. ​AMATEUR Champion Points are awarded to horse/rider teams based on the highest scores received - regardless of Division - in the Schooling Competition. These Champion Points are used to earn Level of Achievement Awards (defined below). Amateur rider/horse teams may earn Amateur Champion Points riding in the Open Division. See Rules & Regulations for current and complete details. ​OPEN Champion Points are awarded to the horse based on the highest scores received in the Open Division Schooling Competition. These Champion Points are used to earn Level of Achievement Awards (defined below). Open riders may earn Open Champion Points on the horse only. Amateur rider/horse teams may also earn Amateur Champion Points. See Rules & Regulations for current and complete details. A Register of Merit ("ROM") is earned by a rider/horse team attaining a minimum of ten Champion Points in each of Ranch Cutting, Working Ranch Horse, Ranch Trail, Ranch Riding, and Ranch Conformation classes. A rider/horse team may earn five ROMs. ​Most Improved Rider is awarded to the Amateur rider/horse team who have completed three schooling competitions in each of two consecutive years. The average score of the first year (three events) and the average score of the second year (three events) will be compared to determine most improved status. ​Rider/horse teams earn the Ranch Horse Champion award after attaining five Champion Points in all five classes -- Ranch Cutting, Working Ranch Horse, Ranch Trail, Ranch Riding, and Ranch Conformation. The intent of the Ranch Horse Performance Champion award is to recognize those horses that may never achieve ten points in conformation. 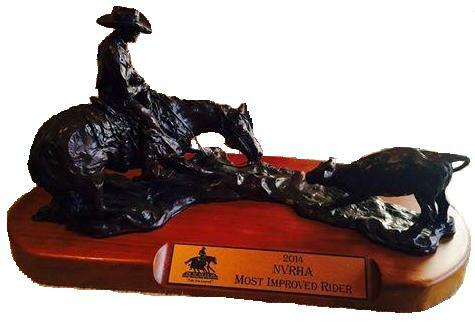 A rider/horse team receives this award when they earn ten points in each performance class (Ranch Cutting, Working Ranch Horse, Ranch Trail and Ranch Riding). Ranch Horse Performance Champion and Ranch Horse Supreme Champion awards will not be given to the same rider/horse combination in the same year. Instead the higher (Supreme) of the two awards will be given. ​Criteria for the Ranch Horse Supreme Champion award is the same as the Ranch Horse Champion, except, a total of ten points must be earned in each of the five classes. 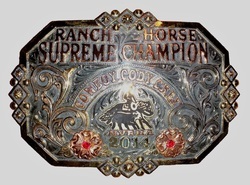 Ranch Horse Champion and Ranch Horse Supreme ​Champion may be awarded in one Award Year. ​The Superior Ranch Horse award is earned in each of Ranch Cutting, Working Ranch Horse, Ranch Trail, Ranch Riding, and Ranch Conformation classes when a rider/horse team attains 40 Champion Points in that class. A rider/horse team may earn five "Superior" awards. The Legend Award is presented to horses having earned two hundred (200) or more Champion Points at approved NVRHA events. A minimum of 40 Champion Points must be earned in any four of the five classes (Ranch Riding, Ranch Cutting, Ranch Trail, Working Ranch Horse, Ranch Conformation). Champion Points are cumulative on the horse and may be earned by multiple riders and owners. The award is intended to recognize extraordinary horses that exhibit the talent and soundness to perform at a championship level, year after year, typically with several different riders; however, one owner/rider after achieving 200 points will qualify for the award. Please refer to the official NVRHA Rules and Regulations for detailed explanations of all Points/Awards. *NVRHA reserves the right to make changes to the type of awards given.